Antonio Delgado at the Dover Fire Department. Photo: Antonio Delgado for Congress. There were few high-profile victories for the Democrats on Tuesday. Rising star Beto O’Rourke flamed out narrowly in the Texas Senate race, dashing the hopes of progressives nationwide; Florida gubernatorial candidate Andrew Gillum lost his race by the thinnest of margins. The big story of Election Day was a less flashy one: the flipping of the House from Republican to Democrat, one low-key race at a time. It’s a local story as well as a national one: Headed to the House to represent the Hudson Valley and Catskills soon is Democrat Antonio Delgado, who eked out a slender victory over incumbent Republican John Faso despite a barrage of negative ads brimming with barely-veiled race-baiting. In a year less fraught than 2018, this race would probably never have unfolded the way it did. It might never have happened at all: the unlikely seven-way Democratic primary that anointed Delgado was a spasm of new energy in a region where Democratic politics have been listless for years. With the Senate now even more firmly in Republican hands, and a conservative majority on the Supreme Court, the shift in leadership in the House won’t fundamentally alter Republican political dominance on the national stage. Since Republicans at the national level have been mostly unwilling to challenge an increasingly unhinged White House, it now falls to the House Democrats to be the front lines in the fight for goals once broadly considered bipartisan: voter rights, civil political discourse, the preservation of political norms. … For many Democrats—and quite a few independents and even a few Republicans—this is a gleeful prospect. After two years of feeling powerless, they will see, for the first time, a sustained, powerful check on Trump’s power and a public investigation with teeth and tools. 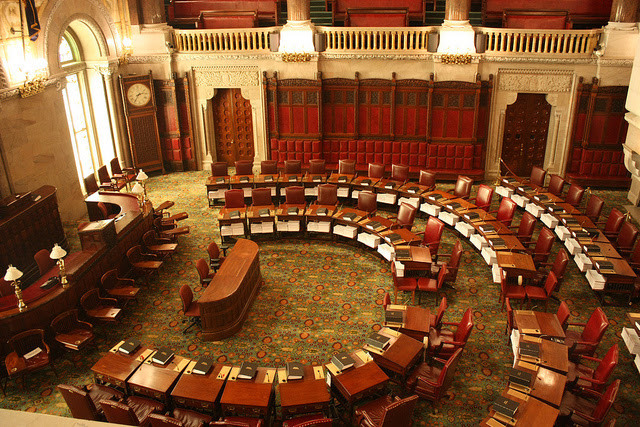 The New York State Senate chamber. Photo by Flickr user -JvL-, Creative Commons license. In New York State politics, the big story on Tuesday was the state Senate. Skewed toward overrepresenting the state’s rural, less-populated regions, the Senate has been in Republican hands for most of the last 50 years – aided, in the last decade, by the Independent Democratic Conference, a group of breakaway Democrats that caucused with the Republicans until their dissolution in April. The members of the IDC came under intense pressure from the left this year, and most of them are no longer in office. Of the eight former members of the IDC, six lost their primaries in September. With the IDC disbanded and the balance of power on a razor’s edge in the Senate, Democrats needed to gain just one seat to take the majority. They took a whopping eight seats. State Senator Andrea Stewart-Cousins, who represents part of the lower Hudson Valley in the 35th district, is expected to become majority leader, making her the first woman to lead either of New York’s legislative chambers in state history. Among the new crop of Democratic New York State Senators: Jen Metzger in the mid-Hudson 42nd, who narrowly defeated Republican Annie Rabbitt in a battle to succeed retiring Republican John Bonacic, and former Assemblyman James Skoufis, who beat Republican Tom Basile a bit more decisively in the 39th. This election was about values. Today the Hudson Valley spoke loudly and clearly that it wants to be a more tolerant, accepting and inclusive place and more civil in its public discourse. In another apparent local repudiation of increasingly divisive national politics, voters of Ulster County ousted incumbent Sheriff Paul VanBlarcum, who lost the Democratic primary to challenger Juan Figueroa in a surprise upset in September. Parts of the Hudson Valley may have opted for more civil politics, but elsewhere, voters handed incumbent Republicans some decisive victories, seemingly untroubled by increasing vitriol and outright racism coming from the national-level GOP. George Amedore prevailed over Democrat Pat Strong in the 46th. James Seward trounced challenger Joyce St. George in the 51st, in a race that for local Democrats was more geared toward building a grassroots organization in a historically conservative region than toward the slim prospect of toppling a popular thirty-year incumbent. Too close to call comfortably: the race in the west-of-Hudson 41st, where incumbent Republican Sue Serino has declared victory on the strength of a roughly 2,000-vote advantage, but Democrat Karen Smythe is still holding out for an absentee ballot count. The decisive Democratic victories in the Senate on Tuesday spell defeat of a sort for one Democrat: Brooklyn’s Simcha Felder, formerly of the IDC, whose personal political power has been dealt a blow by the new configuration of the Senate. 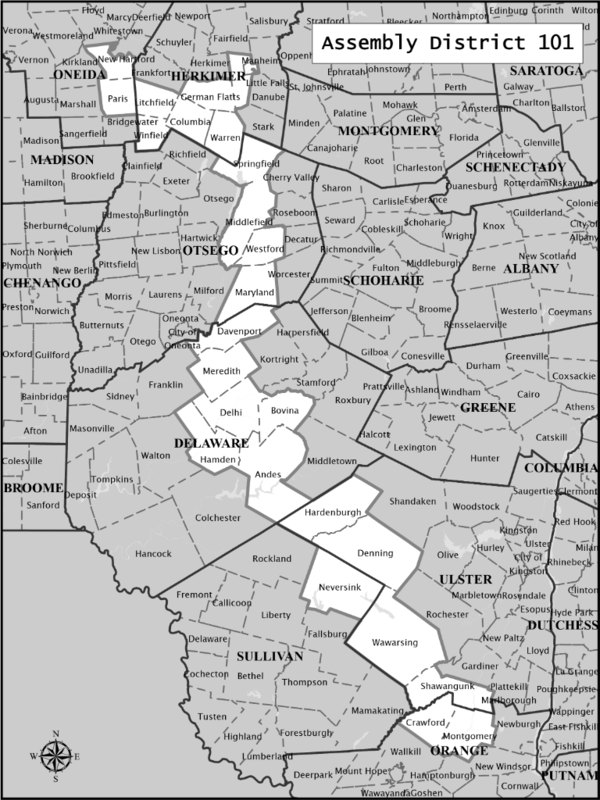 The long, straggling, politically nonsensical shape of New York’s 101st Assembly District. Montgomery, meet New Hartford. The New York State Assembly has long been dominated by Democrats, and Tuesday’s elections didn’t shift the balance of power. The 101st was drawn in 2012, so the story goes, by Republicans to punish one of their own caucus members yet remain a safe Republican seat. In other words, its design is actively antidemocratic. Miller held onto his seat by a comfortable margin on Tuesday, in a result that may have been preordained by geography. Other Republican incumbents in the region did similarly well: Chris Tague in the 102nd coasted to victory over Democratic challenger Aidan O’Connor. So did Kevin Byrne in the 94th, Karl Brabenec in the 98th, and Kieran Michael Lalor in the 105th. It was a good night for Democratic incumbents, too. Didi Barrett easily held onto her seat in the 106th. Sandy Galef, who has been in the Assembly since 1992, beat back her 21-year-old Republican challenger by a huge margin. In districts with two new faces for voters to choose from, races got a bit more interesting. The 104th, where Democrat Jonathan Jacobson and Republican Scott Manley vied to fill the power vacuum left by the death of Democrat Frank Skartados, stayed in Democratic hands this year. In the 99th, where Republican Colin Schmitt and Democrat Matthew Rettig battled to succeed Democrat James Skoufis, Schmitt won the Assembly seat. A few well-known local Assembly representatives had no challengers at all: Democrats Aileen Gunther in the 100th and Kevin Cahill in the 103rd. All told, the Hudson Valley region held few surprises on Election Day. Incumbents mostly stayed in power, Senate and Assembly districts drawn to favor one party or the other went mostly un-flipped, and despite the ferocity of the national dialogue, local races turned mainly on local issues. The exception was the Congressional race, a nailbiter more hard-fought and anxious than any local House race in recent memory. By the time the next Congressional election rolls around in 2020, we hope to build a robust newsroom to do in-depth coverage of the candidates and the issues.